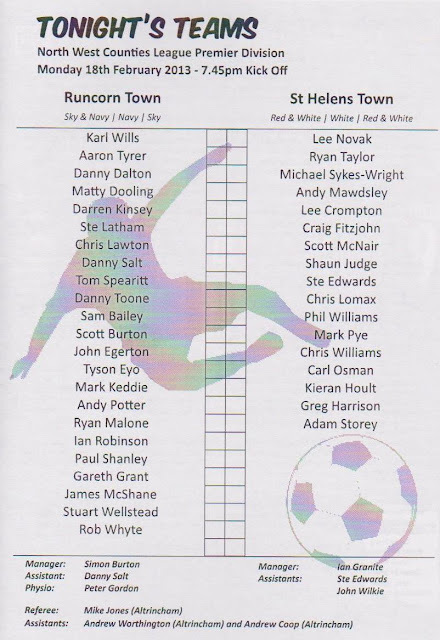 I had seen a Runcorn team back in 1993 when Wycombe beat them 4-1 in the FA Trophy final. 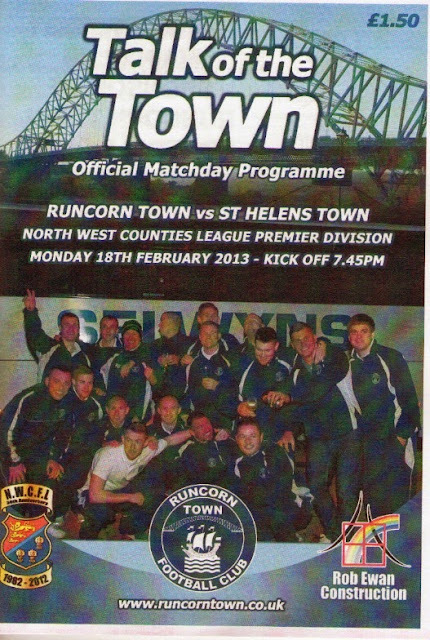 But they were reformed as Runcorn Linnets in the same division as tonight's hosts. Runcorn Town used to be a Sunday team known as Mond United. 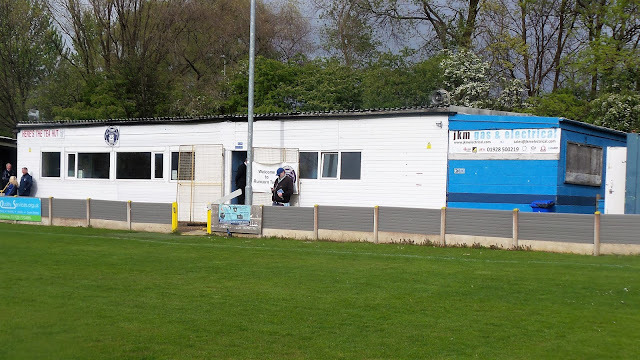 They switched to Saturday Football in 1973 competing in the Warrington and District league and then the West Cheshire League. 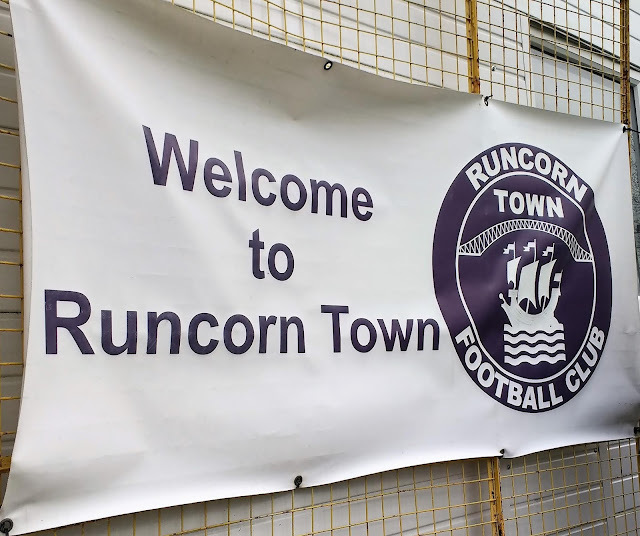 They changed their name to Runcorn Town in 2006, the same year as Runcorn FC went bust. They came onto my list of possible teams to visit in 2010 when they started competing in the FA Cup and entered the North West Counties League. 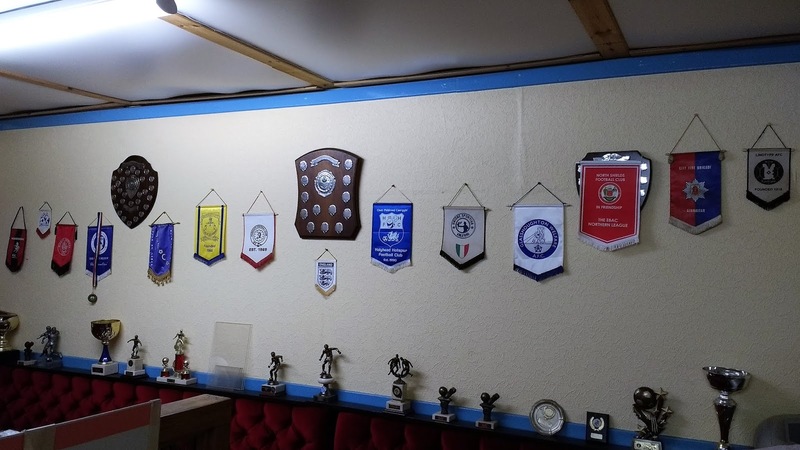 They were promoted from Division 1 in 2011 at the first time of asking and followed that up with a great season finishing 2nd to Champions Ramsbottom United. 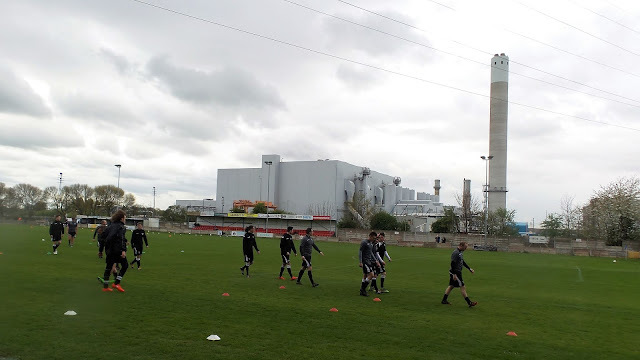 Currently, they are top of the league whilst visitors St Helens Town are battling relegation in 20th place. They have a reputation for playing good football and if that proves to be true, then I am glad they are doing well. 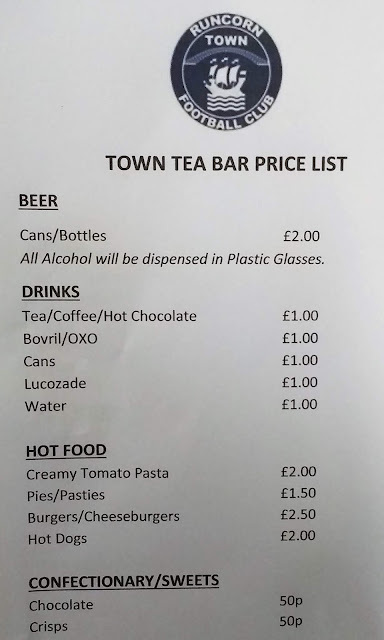 I had already visited the ground on the way back from Tranmere Rovers last season and remembered it as being pretty standard for this level. Monday saw me hunting for a game to fill in the empty days between bigger games. 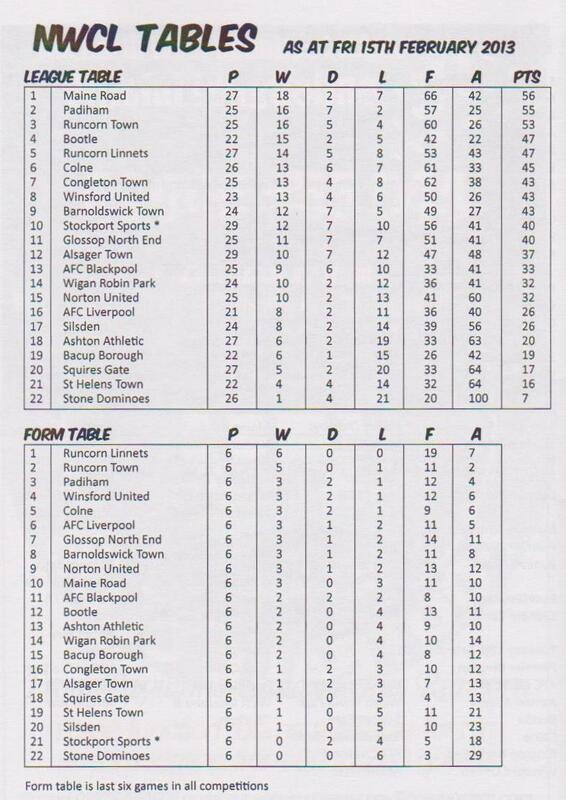 Previously I had done games in the Unibond League at Curzon Ashton and New Mills. 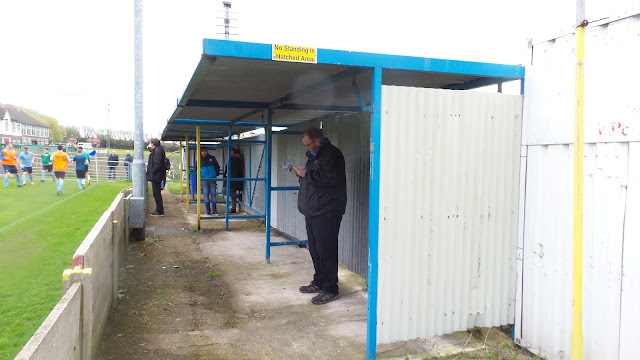 And although Curzon were playing again, I wanted to do a new ground. 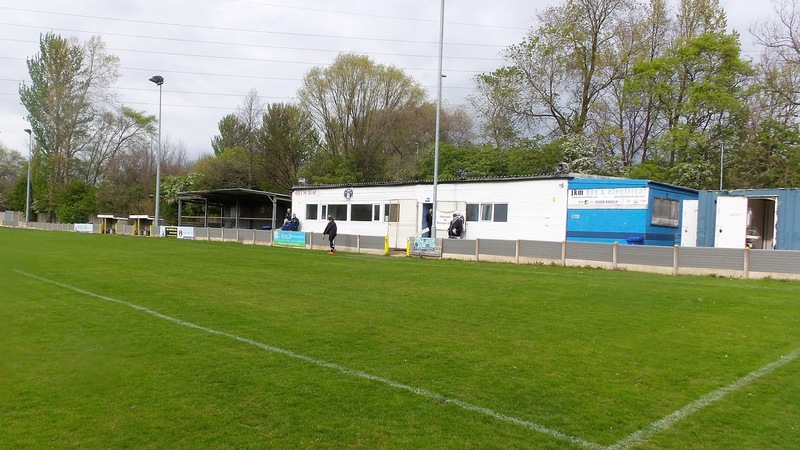 I was left with 2 choices - Runcorn Town or Oldham Borough. Runcorn were a level above so I chose them. It would be typical that whatever one I chose would be a boring 0-0 while the other would be a goalfest but I had made my choice. I booked a hotel near Widnes and would be returning to my previous glamorous location of the M62 services for tomorrow.thinking about it, it would have made more sense to stay at the same hotel but the fixtures had changed since I had booked up. I took full advantage of my 12 o clock check out own the day of the game. After going to get a paper I went up to my room to type up my blog on my iPad, ready for upload when I got home. I really noticed the difference between my old Android pad and this new iPad when typing and managed to type fairly quickly compared to before when the autocorrect was not so good and the screen not so responsive. It wasn't all good news though, I couldn't get the Bluetooth Keyboard that I bought to pair with the iPad, something that I will have to look at when I get home. At a couple of minutes to 12, I went and handed my key into the reception. As I had a few hours to kill, I looked for nearby towns and opted for Bury as it is a place that I have always enjoyed going to. Sadly no revisit to the excellent Trackside pub as I was trying to have a day without alcohol to give my liver a rest! I was also trying to eat a bit healthier too, though spoilt that by having a couple of cakes and a bag of Twiglets on top of my chicken roll, but I was at least moving in the right direction. Bury proved to be a good choice shopping wise though as I got a few old games for 99p each. For the original xBox, I got Rayman 3, England International Football, Atari Anthology and True Crime: Streets of LA. Whilst for the PS1 I got Complete Onside Soccer. I then made my way to my hotel, checking in just after 3. I spent the afternoon writing more of my blog, watching TV, chatting on Facebook and planning the rest of my week. I had to get petrol and get something to eat before I left, but Runcorn was little more than 10 minutes away so I didn't need to leave until around 6.30. I didn't leave until 6.40 as I was replying to texts and messages from all over the place. I filled up with petrol at Morrisons before popping into the store and getting a right bargain. They were marking down the rotisserie stuff and I managed to get 4 chicken kebabs and meatloaf for 47p, which meant dinner was sorted. I also got some fruit. The meatloaf was delicious, but the chicken kebabs turned out to be horribly dry and barely edible. 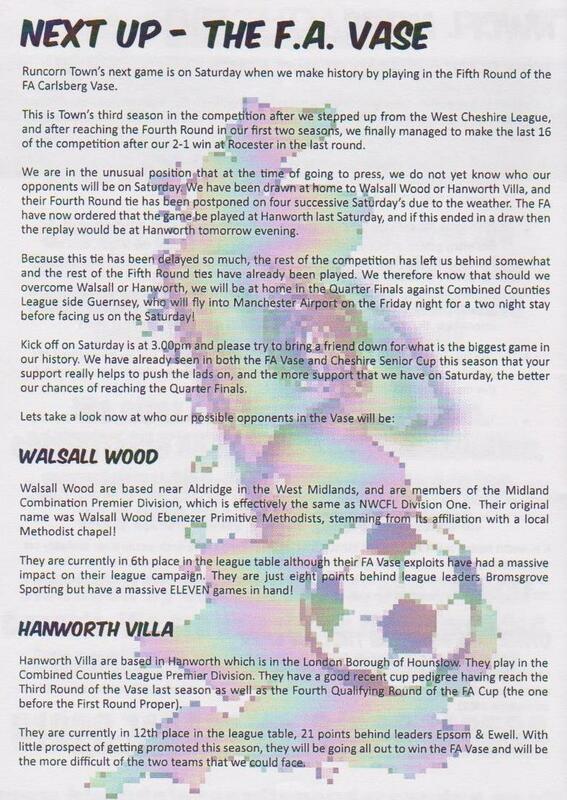 I got to the ground at 7.20, paying £5 to get in and £1.50 for a programme. I went and had a look in the tea bar and round the ground before settling down for the game and checking my phone. 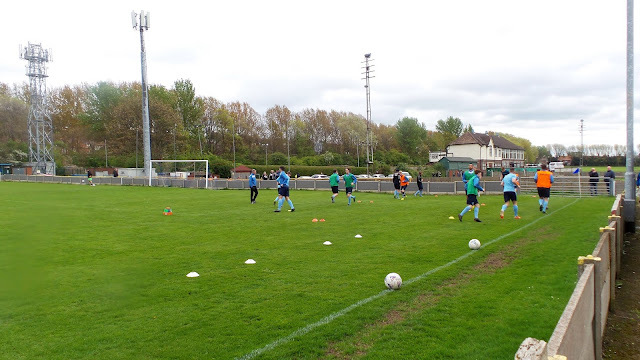 The game kicked off, and Runcorn lived up to their reputation, playing some neat passing football. St Helens were s little more physical, but they were not as bad as their league position suggested. 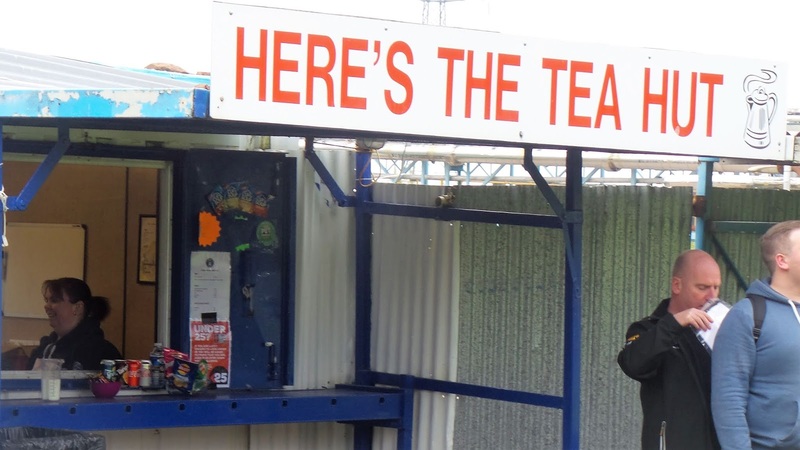 The game was 0-0 at half time, as I popped into the tea bar for a Bovril. The start of the second half was shaded by St Helens and they took the lead on 64 minutes. An initial shot was parried by the keeper, it fell to a St Helens player just inside the area who rifled it in the top right-hand corner. The equaliser came 15 minutes later as a free kick was won on the left. The resulting free kick was floated in and it was bundled across the line to square things up. There were a couple of chances for either side, but nothing really clear cut and the game petered out to a draw that the visitors will no doubt be delighted with. 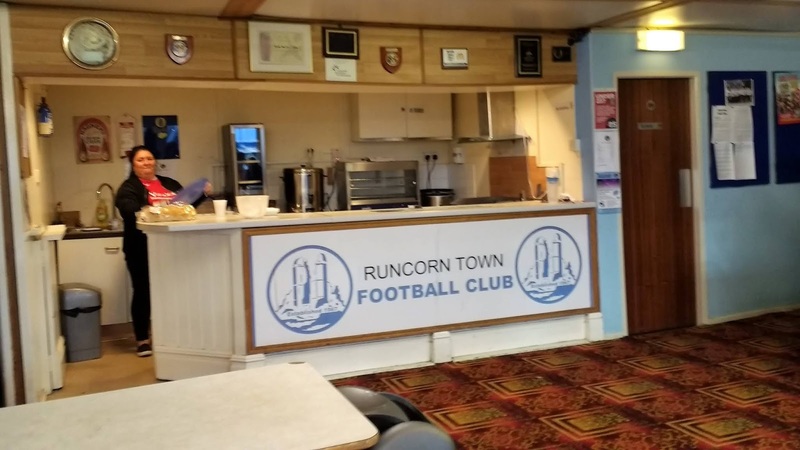 The point sent Runcorn a point clear at the top of the league, but there will be no doubt that they wanted all 3. 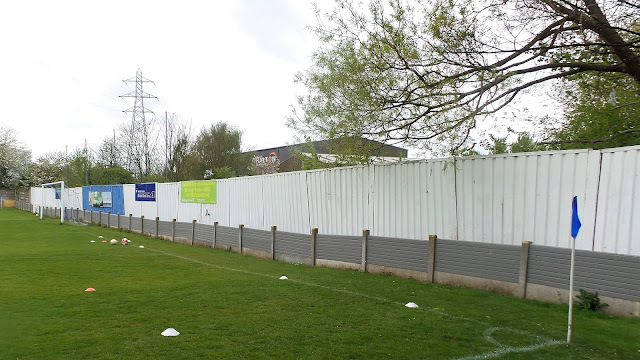 They face Walsall Wood in the FA Vase on Saturday, just a few steps away from a Wembley final. I would later revisit the ground on the North West Counties Hop a few years later, hence the extra pictures. THE PAVILLIONS is a ground that has seen much change in recent years as the club have really pushed on up the leagues and taken their place in the pyramid. It looks to be good enough for the Unibond 1st Division, being quite similar to New Mills FC. The side where you come in has the dressing rooms, the tea bar and a covered terrace. To the left of this is a small covered terrace. The other goal has no accommodation for fans. 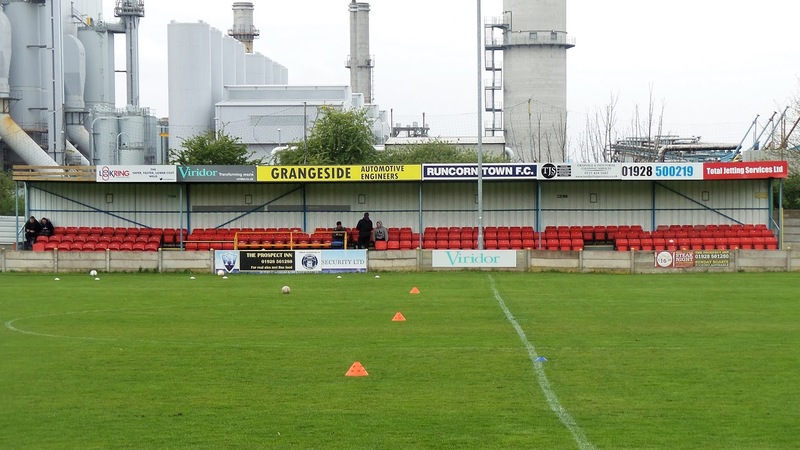 The remaining side has a seated stand holding just over 100 and a covered terrace for around the same amount. The tea bar has a decent range of food for this level and you can actually sit down in the warm and enjoy your purchases as it is a proper room. 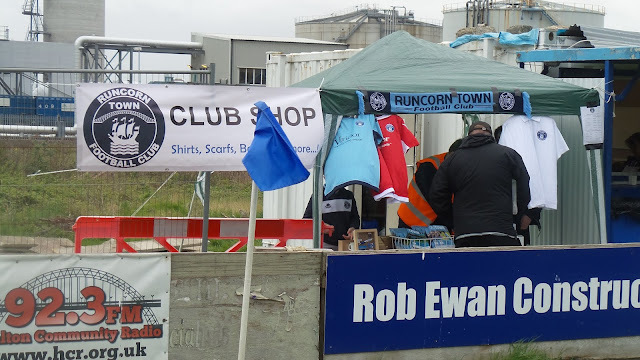 There is a table with a good range of club merchandise at reasonable prices here as well. I am not sure about a bar, but have a feeling there is one outside, not that I visited it. The programme is one of the best I have seen at this level. Well presented, with a decent amount to read. It is also printed on decent quality paper. A lot of the other programmes I have seen from this level are £1 but this is definitely worth the extra 50p and is better than some of the more costly offerings from teams higher up the pyramid. Nice to see you visited Runcorn Town Russ. Enjoyed the report and the pictures. I was hoping Runcorn Town would have beaten St Helens but the visitors have improved (form wise) over recent weeks.